Gas, All-Electric or Oil fueled high pressure heating unit forces hot air throughout the switch area via ducts and nozzles. Complete systems designed and proven for rugged service in severe weather. Keeps switches open and operative during snow, sleet or ice storms. High Pressure Blower forces air around the combustion chamber and through the duct-work, providing even transfer and distribition of heat. Hot air dries up snow. Leaves switch area and dry, minimizing the “snow plow” effect of passing trains. It can be fueled by natural gas or propane and powered by various voltages, single or poly-phase. Electronic Safety circuits constantly monitor blower operation. Directional air flow through adjustable nozzles allows you to direct the airflow where it’s needed. 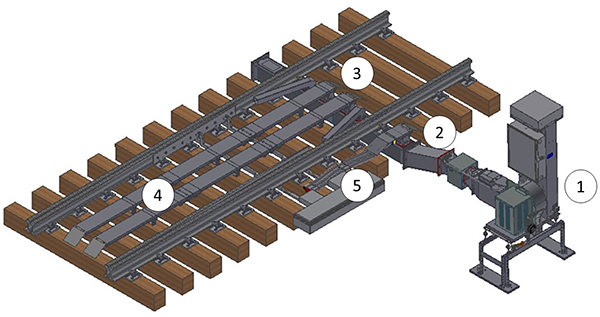 The main duct, which passes under the tracks, is insulated to safeguard against possible track circuit interference. Various nozzle arrangements, duct insulation and heat retainers are available to provide maximum heating efficiency. Hot air blowers may be operated manually, remotely and/or automatically by the rails snow detector.